Thousands of people arrive to Cusco every day, most of them do so to get to Machu Picchu, but there is a place, different from the typical tourist areas and circuits, very close to the Main Square of the Cusco; In it you can take a great look at the day-to-day life of the people of Cusco. The Central Market of San Pedro is a very picturesque and lively place that will keep you entertained for hours. It is in the heart of the city and has become one of the most visited places in Cusco. One of the main purposes of the markets is to provide the freshest products for the locals, and what better opportunity to see the everyday life of the people of the city. Without a doubt in San Pedro Market in Cusco, it is one of the best ways to experience the daily experiences of the people of Cusco. Stay alert, you will find many “things” that will assault your senses and possibly also your sensitivities. The Central Market of Cusco houses a large number of food stalls, with whole sections, dedicated exclusively to fruit juices and juices, snacks and prepared meals. If the weather is cold, one of the best options is the broth (lamb), but if the sun usually shines, you can enjoy a delicious ceviche (raw fish marinated in lemon juice). Hidden between the aisles of San Pedro Market (in the fruit section) you can find stalls with exotic products brought from the Amazon, herbal tinctures, and ointments based on the tallow of certain animals. Here you can buy coca leaves and prepare your own infusion; The mate of coca is one of the best natural remedies to combat the Evil of Height. There is a row dedicated to chocolate, here you can find a mixture of delicious chocolate, coca leaves and mint (very delicious). It is not unusual for people coming from nearby provinces to come in typical costumes, carrying their babies on their backs in typical blankets, from which they seem to fall, but you will see that this is not the case. The Central Market of Cusco is located 5 blocks from the Main Square of the Cusco in the western direction near the train station of San Pedro. How to get to San Pedro Market? Although there are already some tours that include the Central Market of San Pedro; If you prefer to go on your own, you can reach the San Pedro Market from the Main Square of the Cusco; Just follow the street that goes from the Church of the Company of Jesus to the right side of the Main Square, towards the convent of La Merced, then continue straight along that same street, cross the square San Francisco and in a very short time Will be at the main door of San Pedro Market. It is easier and quicker to walk than to take a taxi, so venture into Cusco City and visit the Central Market of San Pedro. Any travel itinerary should include the San Pedro Market, especially if you want a fascinating and fun cultural and experiential experience. 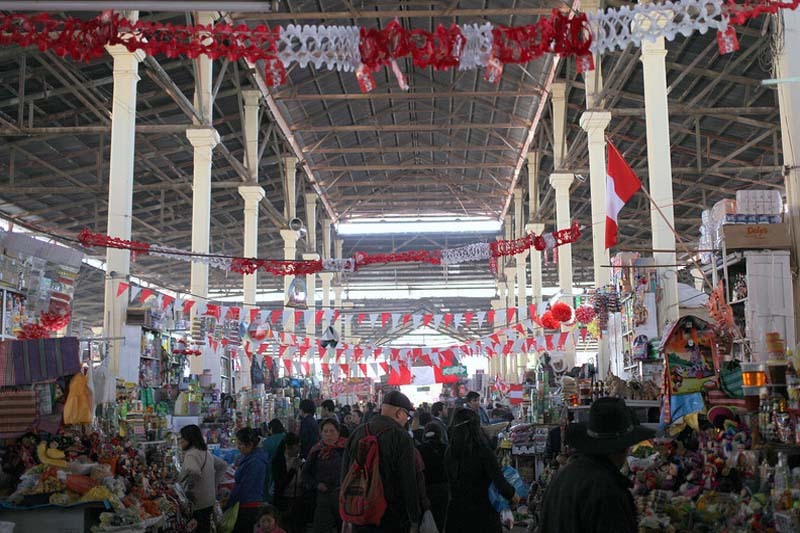 Well if you did not know, the San Pedro Market is one of the best places to learn about the Andean culture. He will hear the Quechua language pronounced correctly. You can see common gestures and habits in the Andean culture. You will feel the mix of local products and flowers. You can see artisan clothes and some places where they are made, typically. See the “typical ingredients” with which the traditional meals of the city of Cusco are prepared. Sample delicious local foods and desserts. And since any good cultural experience has its fun side, part of the fun is to hear the ingenious ways of marketers to catch the attention of customers. Not all people feel comfortable in the meat section, and not only can you see common cuts of meat, you will see heads of different animals staring at him, but that is not all, you will also see some rather strange “cuts” Snouts, testicles, visors, also some blood, nothing is wasted. At the San Pedro Market you can try exquisite fruit drinks, and that’s a promise. After choosing the spot that catches your eye, you can try many unique fruit blends. Try special juice, a mixture of many fruits, with milk, malt beer, honey, algarrobina, etc. The Incas believed in nature, and the remedies used in the treatment of many diseases were made with herbs. The Coca Leaf was considered sacred to the Incas, and is indicated in the treatment of many diseases. Some of the soups (or broths) are made with chicken and vegetables, but others are made from the head, or from the legs of sheep. Although they are delicious, for some people it may be very strange to see a sheep eye boiled, accompanied by potatoes and rice; But there may be some other dishes that may hurt your susceptibility. Surely if you come from the United States ask yourself how is it possible for Peruvians to cook guinea pigs? But open your mind and your palate since maybe in the US they are pets, but in Peru it is one of the most delicious dishes there are. So pick one and enjoy it. Very close to Cusco in the Sacred Valley of the Incas is the small town of Urubamba, one of the best producers of white corn in the world; But in the market of San Pedro, you can see varieties of corn of all colors and sizes, such as the purple corn, which, although not eaten, serves to make one of the typical Peruvian drinks, the delicious chicha morada. You can stop to drink or just watch as someone else drinks the very rare extract of frogs. A lady catches a small frog and hits her head on the side of a table and then removes her skin and puts it in a blender mixed with water and other substances to take away the taste a little. Round breads of more than half a kilo of weight, “bread Chuta” and “bread of Hurcca”. Tropical fruit from the jungle of Cusco, try the “passion fruit”, known as the passion fruit. Potatoes and other tubers of numerous and strange shapes and colors. “Blood of degree”; Surely it can be confused with blood from a freshly slaughtered animal, but it is rather “sap” from the bark of a tree that serves to calm bone pains, but something more surprising certainly is its healing power of the Wounds and blood clotting. Cusco and Machu Picchu offer a rich traditional culture and you can still feel and live. Do not wait any longer and start your adventure. For more information, please contact us at info@boletomachupicchu.com.